The distinctive Australian Army Utility Knife was designed and manufactured in Australia during WW2. These knives are something of an enigma. 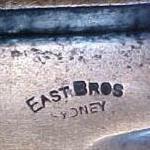 For a long time, collectors have believed that these knives were made for issue to Australian Service personnel. However, recent searches have failed to find any documentation to support this. There is no doubt that by 1945 that the Australian Military was moving towards the acquisition and issue of a Utility knife to front line troops. There is ample evidence of this. There is also evidence that the troops were purchasing their own knives where possible. The fact that many of the knives have Government acceptance marks has made the subject even more confusing. It also appears that they were supplied to the US for issue to their forces. Many of these knives turn up with US stamped on them. Were these knives purchased by the US Government or were they unit purchases? They are often referred to as an Australian Commando Knife and sometimes as a Fighting Knife; this is not really correct. The Australian Army Stiletto is the Australian Commando Knife. This knife appears to have come in to service because the Stiletto design was for a specific purpose and was unable to fulfill the role of an all round knife for general use, camp chores and if need be a combat knife. There is evidence of several designs being submitted during the war to fill this need. The resultant Utility Knife may well have been issued at first to the members of the Independant Companies (Commando) and that might be where the association came from. It is clear that their design is as a Utility Knife. 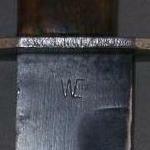 There appear to have been two patterns of Utility Knife of similar design made during the war. They appear to differ only in the handle shape. 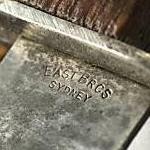 The first pattern appears to have been made only by Gregory Steel products of Melbourne. It had a rounder "coke bottle" shape handle. According to the records found so far, this pattern knife was issued to the men who carried out "Operation Jaywick" the successful attack on Singapore Harbour by the men of Z Special Unit. The most common pattern knife which was made by at least four manufacturers had the simpler flat slab sided grip. Information on its issue and use has been hard to find. I have been unable to find any information on the numbers produced. It has proven difficult to find WW2 photographs showing the Utillity Knife in use by Australian troops. If anyone has photographs showing the knives in use, whether it be in training or in the theatre of operations, I would like to hear from them. I would also like to hear from veterans who can recall being issued with a utility knife because it would be nice to find out when and where they were used. I would also appreciate hearing from family members who were aware of these knives in the possession of WW2 veterans who have since passed on. 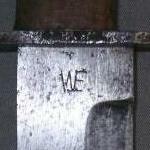 The knife shown above was supplied to the US for issue to their forces. 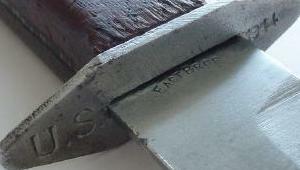 Clearly seen is the Inspectors acceptance mark which has been stamped in to the left hand scale. It has a US identification mark stamped under the cross guard. 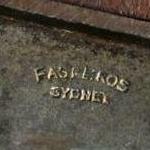 The makers mark appears to have been poorly struck and the word Sydney is not seen. It appears that knives were supplied to the US Government for issue to their forces. These knives usually had a US marking on them. This is one example of such marks.